I was reading a thread at Facebook in our user group, someone was trying to compress/compact/optimize a VHD(VHDX files but the result was depressing, the amount of reclaimed space was zero and that is kind of low… Now there is a good explanation for that, when using the UI there is no way to configure it and the UI also don’t inform you that the ONLY way to get it small is to mount it in Read Only mode. It really has to be mounted, otherwise there is now way to see “inside” the disk and to get rid of all the Zero blocks. It does not hurt if you also run defrag and cleanup inside the VM before, but the most important thing is that it needs to be mounted. This doesn’t seem to work if the VM has a snapshot. Nice PowerShell Script, very much needed. This seems to be a must to be able to shrink volumes. 1. 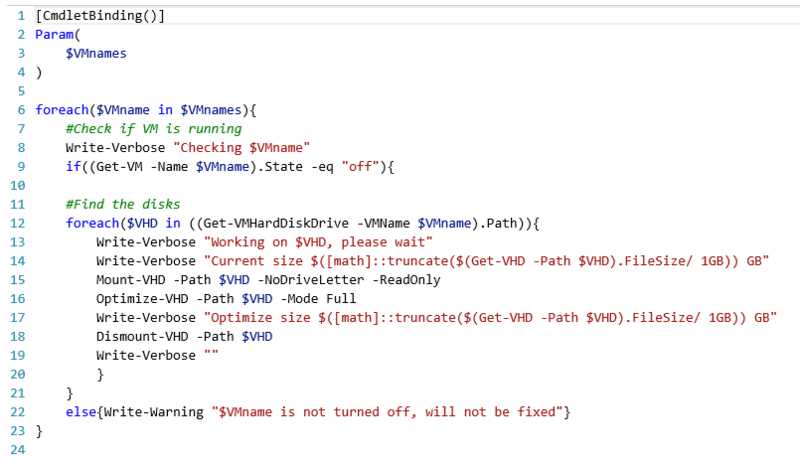 Is there a way to perform a defrag as well from Powershell when the VM is shutdown (in this script), or how is this solved in the real life? 2. I have modified the script so I have a TXT file that have all the VMnames in it, but is there a way to put the “-Verbose” parameter from the “command line” into the script instead? I will test your code below as soon as I can! Is there no way to perform the Defrag of the VHD aswell? I know this is now bit of an old article but I have issues with a lot of the objects not existing. I made a few changes so this can also be run from the System Center host for a clustered environment. Hope it is able to help someone else out. How can I achieve this without shutting the VM down, if I move the VM to another Cluster Shared Volume it releases the white space…..so if this cant be achieved without shutting down, anyone got a good script to report on white space (the difference between used space in a VM and VHD size)? We do use SCVMM so would greatly appreciate! Sorry I need to backtrack, can you show the function just directly for Hyper-V?